It has been a marathon of reading for me to absorb this book series. 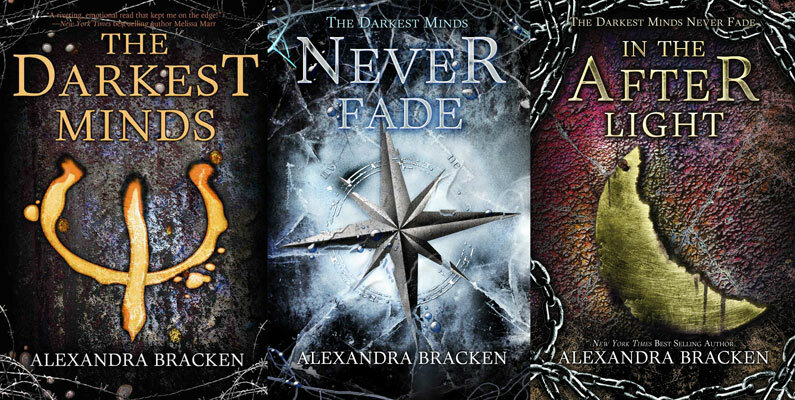 In the last 5 days I have completed books 1, 2, and 3 of Alexandra Bracken's "Darkest Minds" series. There are two novellas that I have not read, unfortunately, because they are not available on my Nook Glowlight, but having not read them did not detract from the enjoyment of the rest of the series. If I can get my hands on them in the future I will definitely be reading them. Here is the synopsis for the three books, with as few spoilers as possible. You follow Ruby on her journey of self discovery. You meet her when she's 16 and surviving life at basically a concentration camp for "Psi" kids - kids with special abilities. She escapes and meets up with some other kids with special abilities and travel through West Virginia, trying to figure out how to control her abilities to keep her from hurting anyone else. Book 2 starts with Ruby, who has now mostly harnessed her abilities, doing a special ops mission for "The Children's League". In the war between adults and "psi" children, "The Children's League" is a group that rescues kids from the concentration camps and uses them as soldiers. Ruby is the leader to 3 other "psi" kids and must protect the people that she loves without losing herself. In the final book of the series, Ruby finds herself leading the revolution. Intent on rescuing the kids from the concentration camps, everything is on the line and dependent on Ruby, just when Ruby is most vulnerable. She'll sacrifice everything that she can to protect and save the people that she loves.